[SatNews] Airbus Defence and Space has started work on the MUSTANG project for machine to machine (M2M) communications, in partnership with the SMEs SIGFOX and SYSMECA, and the CEA-Leti research center. The project focuses on low-cost exchange of short messages in the fast-growing M2M market, with the aim to develop an innovative hybrid terrestrial/satellite access solution for the Internet of Things (IoT) for seamless and ubiquitous communications across the globe. Supported by the French Government’s General Directorate for Enterprise (DGE), the project will receive public funding through the Future Investments Programme (PIA) run by the General Investment Commission (CGI) and the French ministry in charge of Digital Affairs. The strategic target is to develop an innovative terrestrial/satellite solution to penetrate the worldwide IoT market, giving French companies a strategic foothold in this growing application domain. The IoT will lead to people being surrounded by hundreds of connected devices that will ease and revolutionize their way of life wherever they are. However, the full potential can only be achieved by adapting networks and, in more specific terms, by offering affordable mobile communications everywhere and at all times. 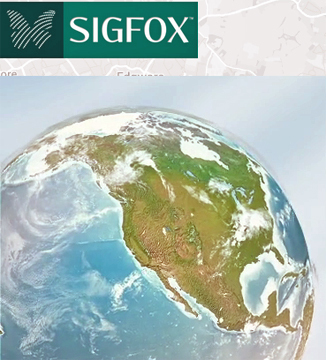 Satellite links will use a dedicated communication protocol to ensure excellent coverage using a small form factor terminal, while 868 and 915 MHz ISM band will be used to communicate with the SIGFOX terrestrial network. The dual-mode satellite/terrestrial terminal will enable automatic switching between the two communication channels in response to resource availability in the areas where connected devices are located. The three-year project will involve the development of the terminal’s modem chipset, the optimization of communication protocols and the validation of the system through an aircraft application demonstration. Performance objectives will be achieved primarily through developments in integrated circuit technologies and in enhanced communication protocols for short messages. Based on new terrestrial and satellite communication technologies, the solution will enable connected devices to communicate on a global scale, offering users a fully integrated and optimized low-cost short message service.